RIO DE JANEIRO (AP) — A nationwide strike by thousands of truckers brought much of Latin America's largest nation to a halt on Friday, prompting Brazilian President Michel Temer to authorize the military to use force in removing drivers and their parked vehicles from highways and other roads. Truckers angry over rising diesel prices began the strike on Monday and continued it Friday despite an announced deal between the government and transportation unions late Thursday. Temer, a lame duck leader who is deeply unpopular, said in a national address Friday that a "radical faction" of holdout truckers was keeping the country from getting back to business. He said the armed forces were being activated, though he did not provide specifics. "We will not allow hospitals to go without supplies to save lives," Temer said. "We will not allow children to be impacted by the closing of schools." 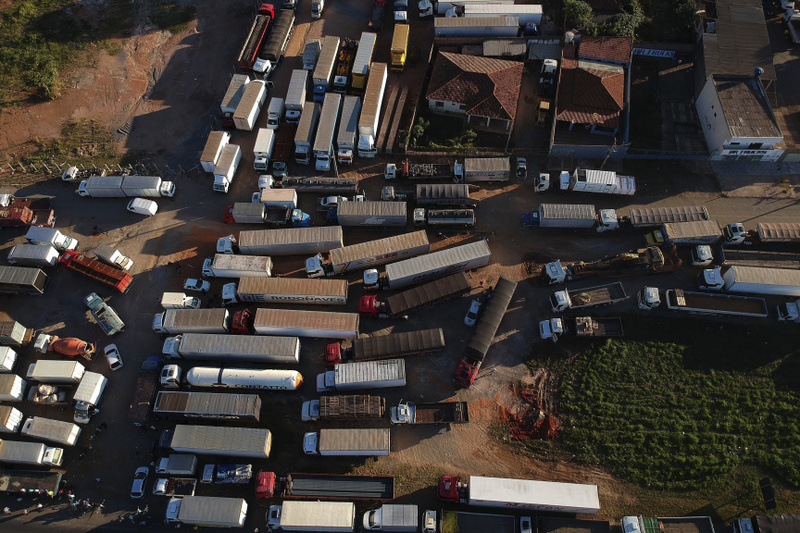 Hours later, the Brazilian Association of Truckers, one of the largest unions that had walked away from talks with the government on Thursday, called on its members to remove their trucks from roadways but "continue to protest peacefully." The association blamed the government for taking so long to respond to trucker complaints that go back to last year. "It's regrettable that even after so many delays, the president prefers to threaten truckers with the use of force rather than respond to their needs," said the statement. It was unclear whether truckers would start getting off the roads or whether authorities would take action against them, as any showdown could be violent and the removal of thousands of 18-wheelers would be a logistical nightmare. Still, the five day strike appeared to dare authorities to respond thanks to road blockages and a domino effect of paralysis that occurred after the transportation of fuel, food and other goods was stopped. Thousands of public schools announced closures on Friday, as teachers and other staff could not get to work. Store managers complained of shortages of several foods, and several airports said they had run out of fuel. The international airport in the capital of Brasilia announced that nine flights were canceled, including an American Airlines flight from Miami. Brasilia, which is in the middle of the country, has been particularly hard hit because it gets fuel from trucks coming from Brazilian coasts. The mayor of Sao Paulo, Brazil's largest city, declared a state of emergency Friday afternoon. The measure would allow the city to buy gas from private gas stations without a bidding process and spend beyond its fiscal budget, according to a statement. Under the deal reached late Thursday, truckers would suspend their strike for 15 days to give time to all sides to find a solution. During that period, the government said it would subsidize fuel prices by lowering several taxes, though some of those changes would have to be approved by Congress. As part of the deal, a previously announced 10 percent drop in diesel prices by state oil company Petrobras would be extended from two weeks to 30 days. For many truckers, however, those moves were not enough. Luiz Antonio, a trucker who was striking outside of Rio de Janeiro on Friday, said he didn't trust what had been negotiated in Brasilia. "They made a deal, there was a lot of blah blah blah, and then after we clear the roads they won't follow through," he said. One of the unions that helped craft the deal appeared to be distancing itself from it Friday. In a statement, the National Confederation of Autonomous Transporters said it had not agreed to the strike's suspension. "Our role is to take the proposals to each group of demonstrators for them to decide if they are sufficient to suspend the movement or continue," the statement read. The strike comes as Latin America's largest economy struggles to fully recover from its worst recession in decades. Unemployment has yet to decline, and the Brazilian real has dropped sharply against the U.S. dollar over the last few months. Gilberto Braga, a finance professor at Ibmec University in Rio de Janeiro, said the spike in prices is being caused by two factors the government can't control: rising global oil prices amid tensions between the United States and Iran, and the devaluation of the real. The government must either subsidize fuel by lowering taxes or allow truckers to charge more for their routes, costs that would ultimately be passed on to consumers, he said. "In the short term, there can only be a truce," Braga said. "Any solution will be very costly."